Leo P. and Eleanor T. (Trainor) Theriault – of Florida, formerly of Wilmington and Woburn. Eleanor was a loving mother and wife and Leo, a retired conductor with the B&M Railroad. Eleanor died on December 24, 2012 at the age of 89 and Leo died on October 20, 2018 at the age of 99. 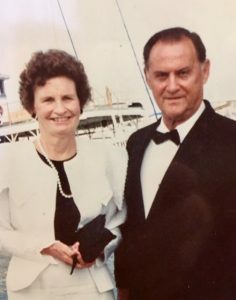 Both passed away in Palm Harbor, FL where they had enjoyed their retirement years, after raising their family in Wilmington for most of their lives. They are survived and will be deeply missed by their children, Paul, Bob and Jane Theriault, and their grandchildren, Ashley, Scott, Virigina and West. At the family’s request, there are no calling hours. Relatives and friends are invited to their graveside prayer service of Saturday, April 27th at 11 a.m. at the Calvary Cemetery 686 Washington St, Winchester, MA 01890. Service arrangements pending, please check back soon. Paul, Bobby and Jane, I have thought of your parents so many times through the years. Your mother was so sweet, kind and funny. I’ll never forget how she always called me “lovey” (as she did so many others) but she made me feel so special. I remember running into your father at the Woburn train station when I was 15. I was skipping church and I thought for sure he knew and was going to tell my parents. 🙂 I have so many fond memories of your family down Humarock.